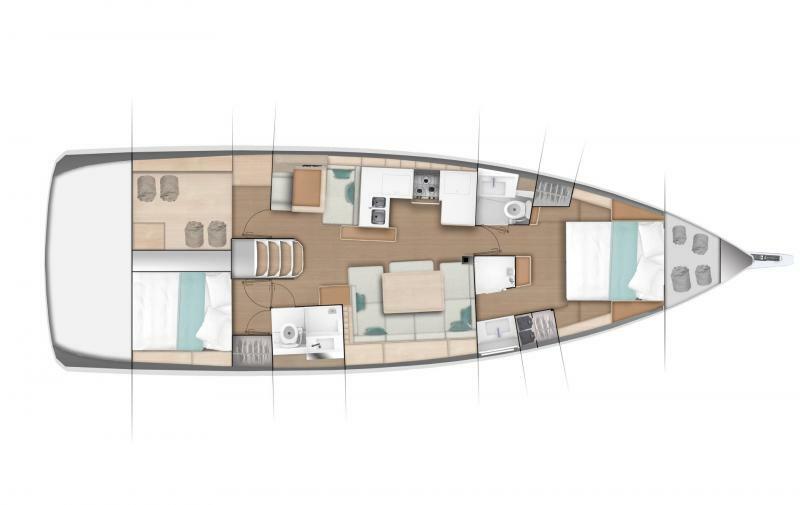 True innovation is rare in yacht design but this boat delivers in spades. 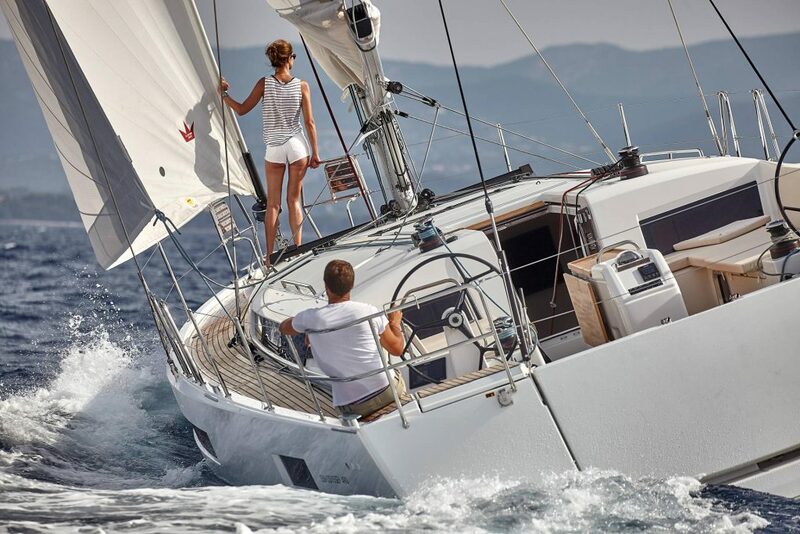 It has revolutionary thinking that turns convention on its head. 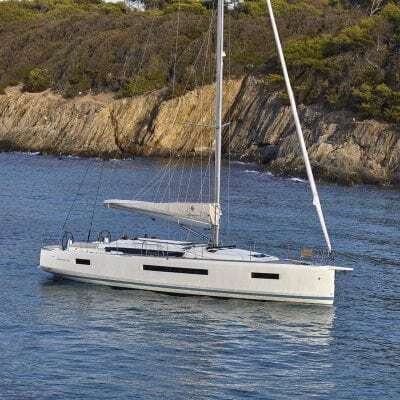 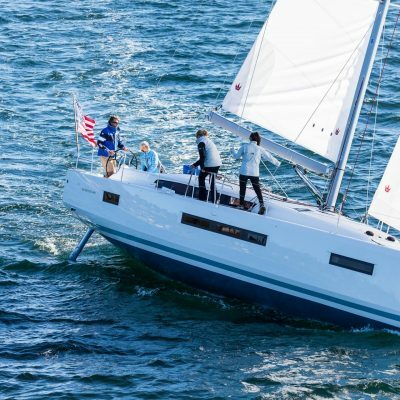 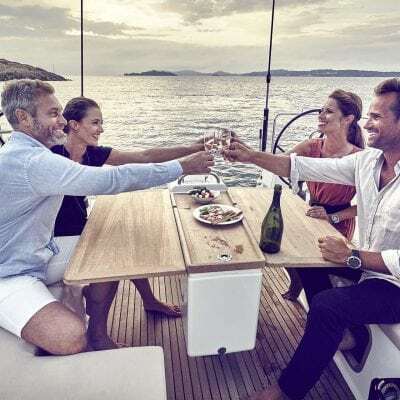 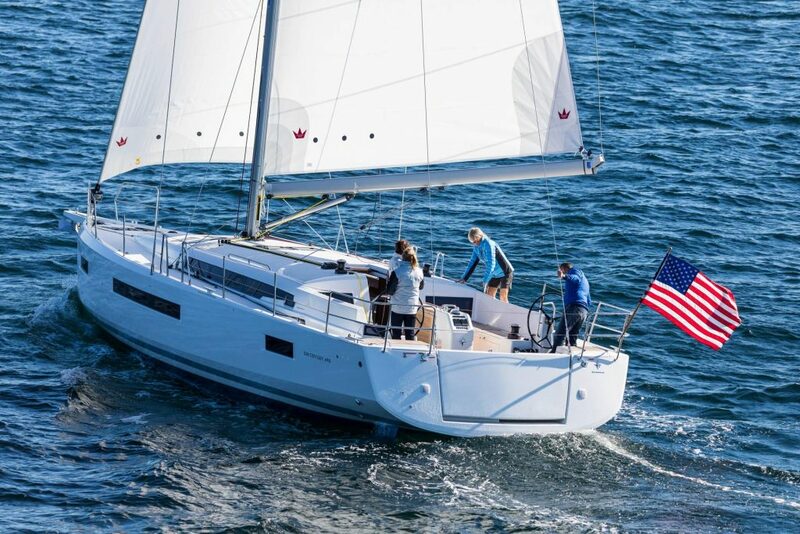 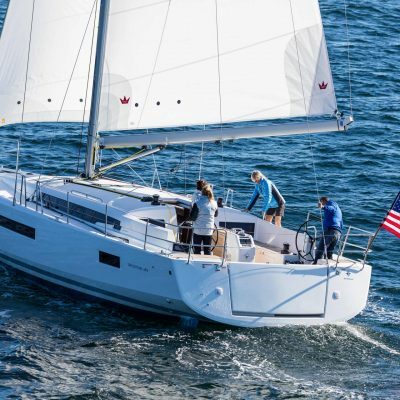 With a new hull design, an innovative deck plan outside and ingenuity below, it is no wonder that the Jeanneau 490 was voted Best Imported Cruiser for 2019 by Cruising World Magazine. 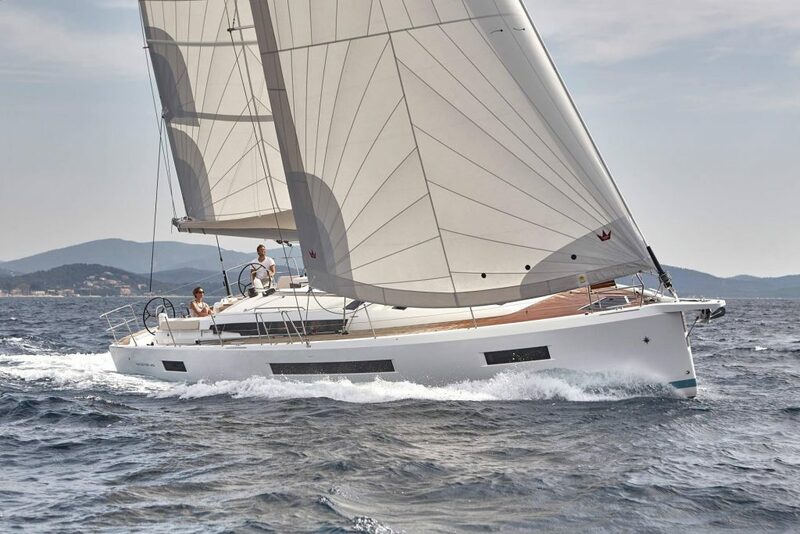 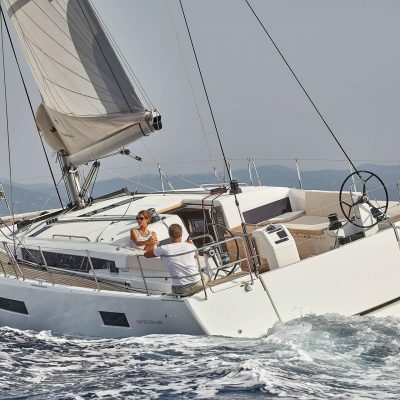 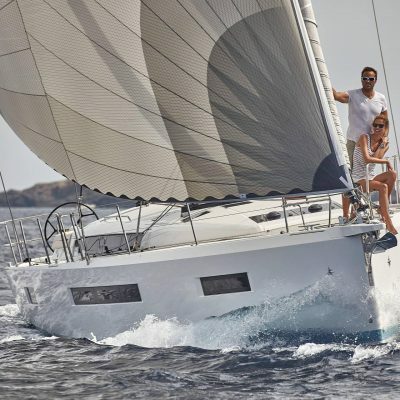 Contact us for full specification and pricing on the Jeanneau 490. 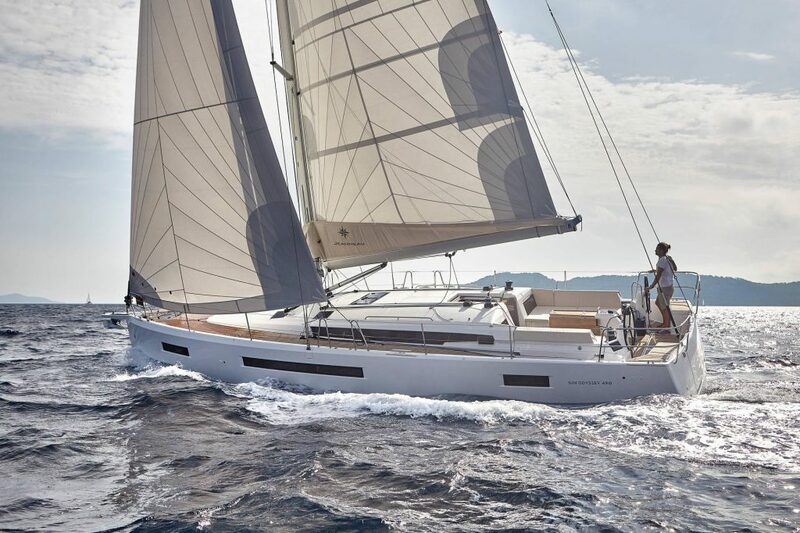 Email our yacht sales manager Robin Hodges. 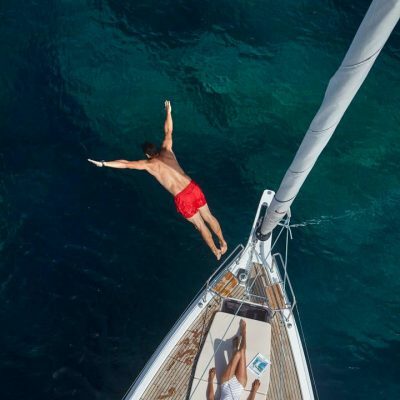 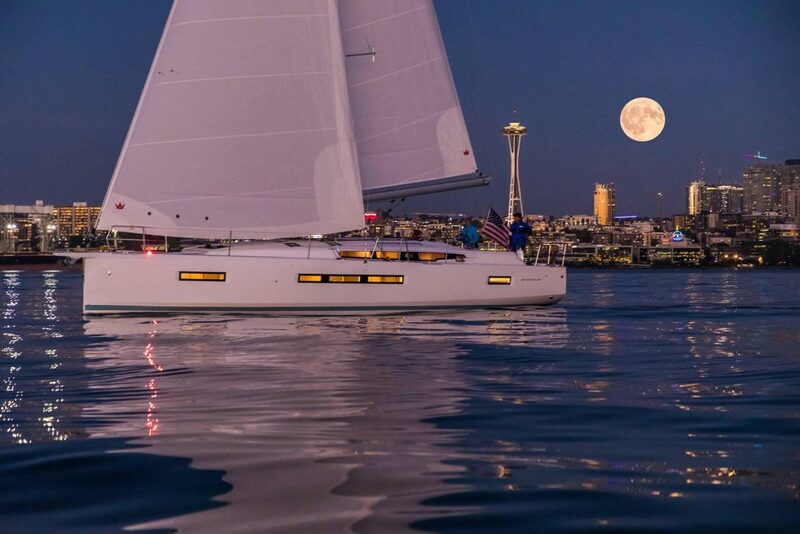 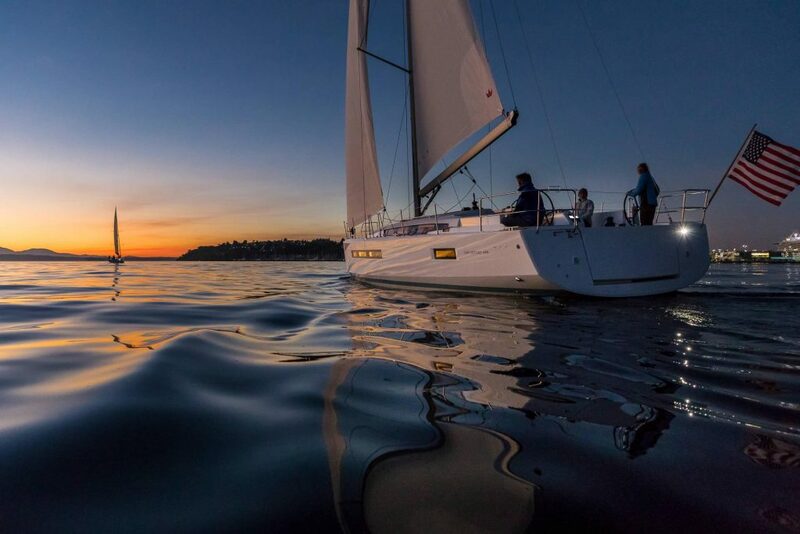 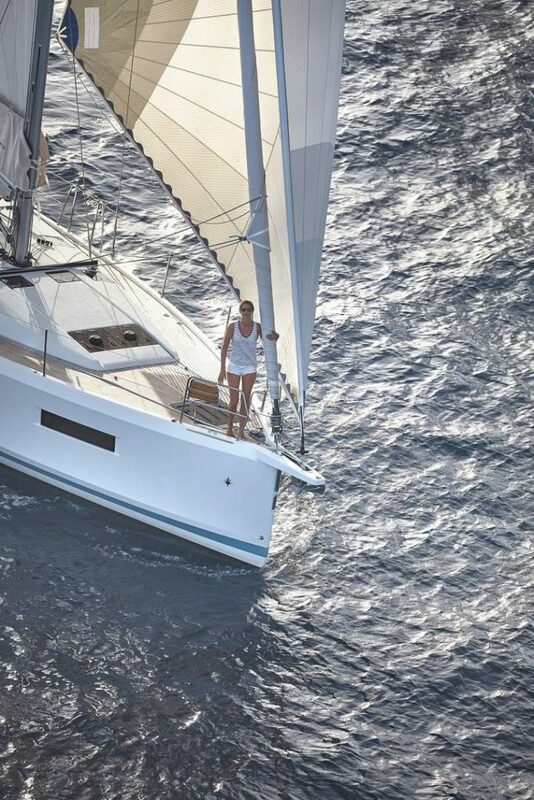 robin@horizonyachtcharters.com Or please scroll down to read more. 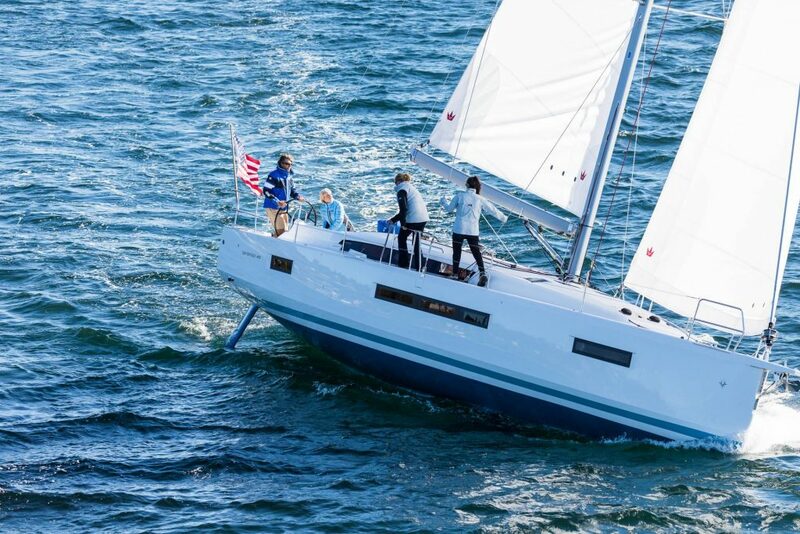 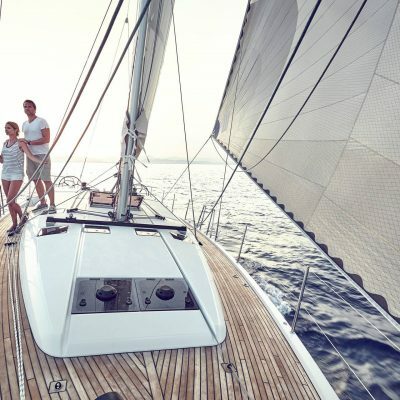 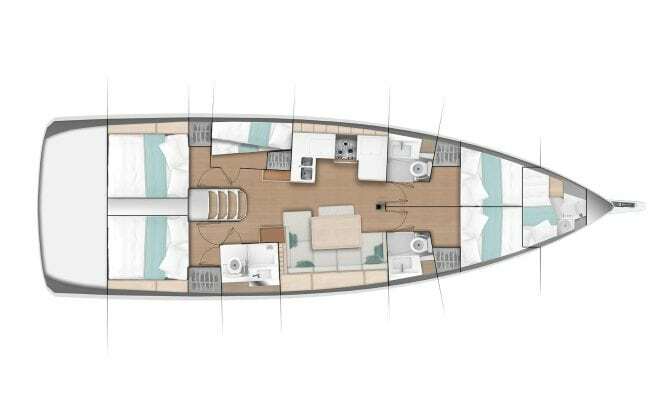 The new model Jeanneau 490 has introduced a truly innovative deck layout that is completely original. 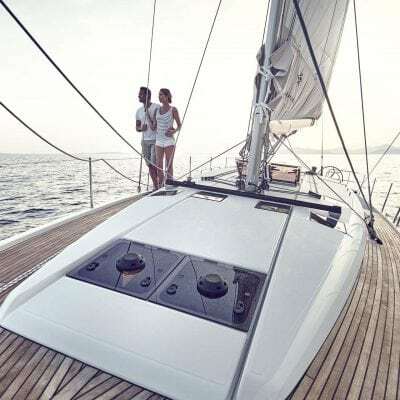 The new “walk around” side deck slopes gently down towards the helm station each side so that there is no more clambering over thwarts and coamings to get from cockpit to side deck – you simply walk around the helm. 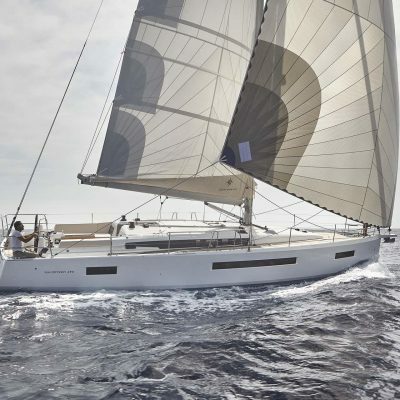 And the helm itself has forward facing seats so you can helm without having to twist your body and crane your neck. 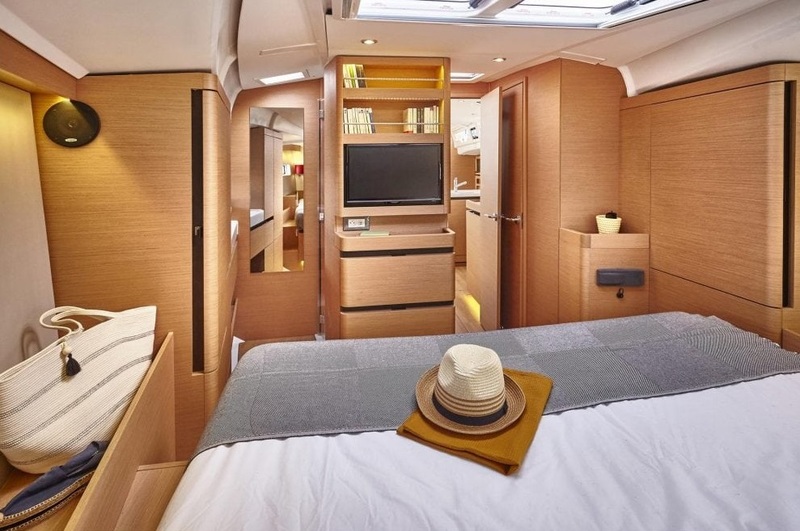 But designer Philippe Briand didn’t stop there. 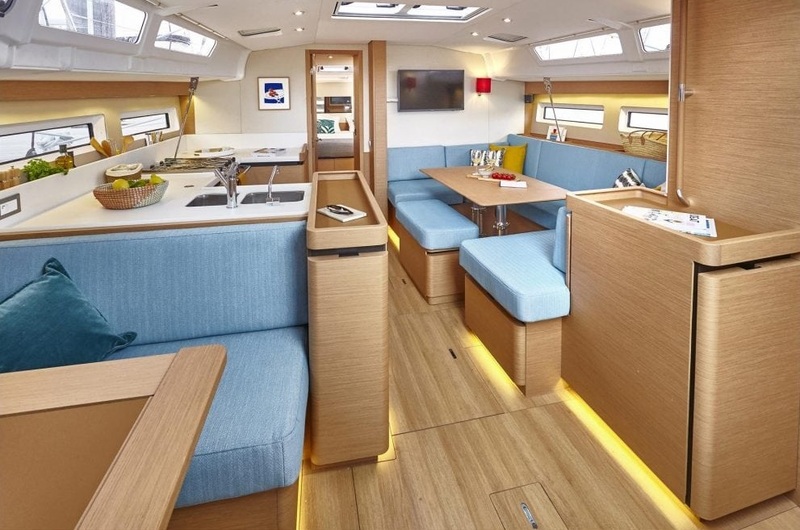 The coamings are now hinged so you can fold them out to make daybeds on either side. 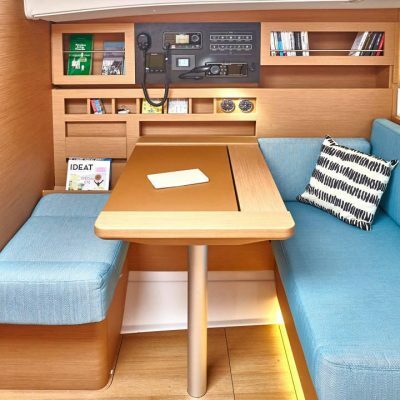 In the case of the starboard pad, it can extend all the way to the cockpit table (with a filler cushion). 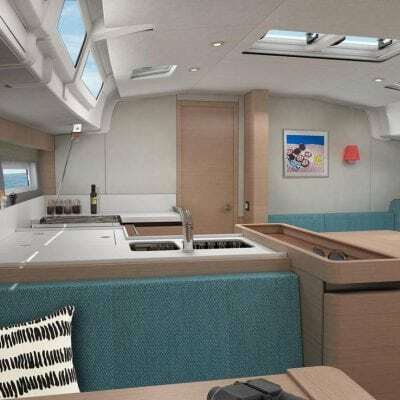 The cockpit table is also offset slightly allowing a walkthrough passage even when one table leaf is open. 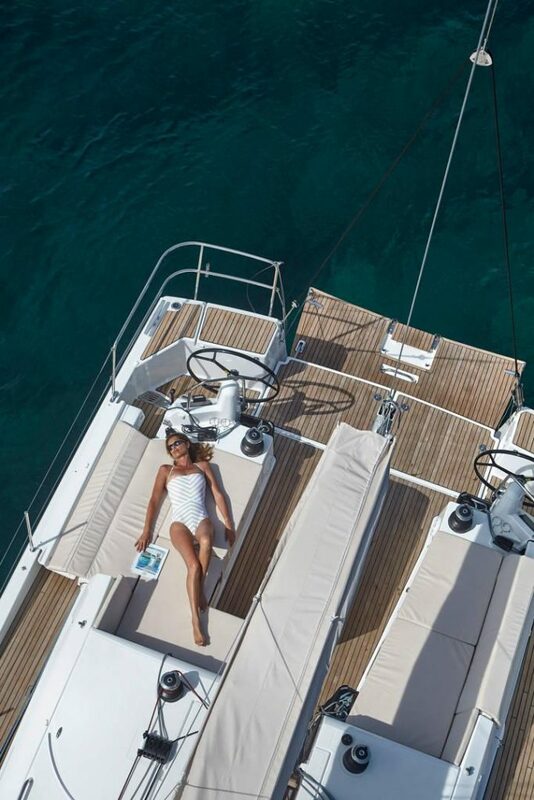 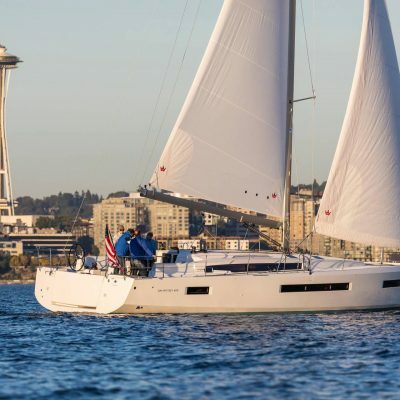 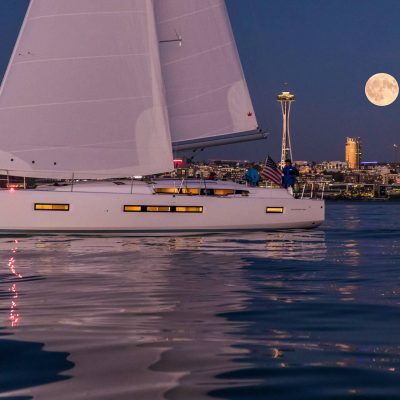 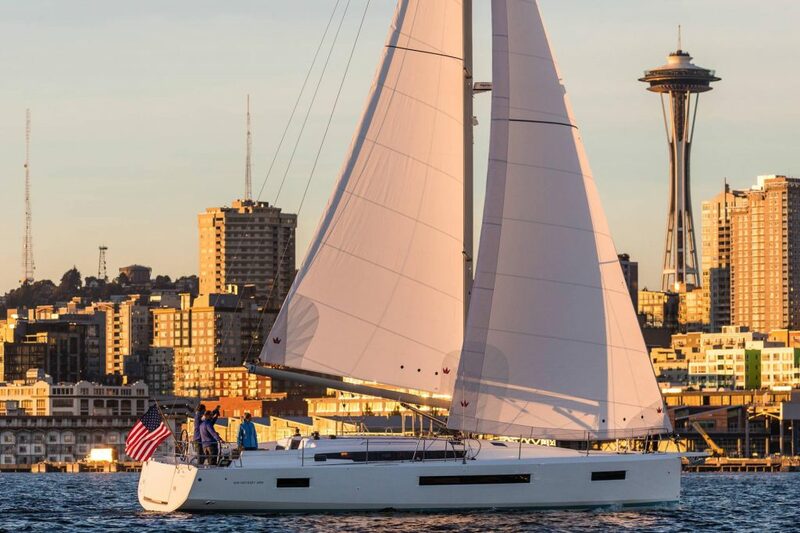 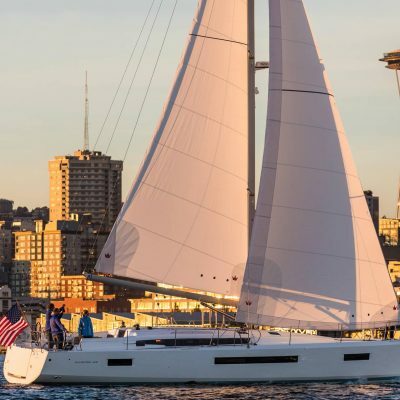 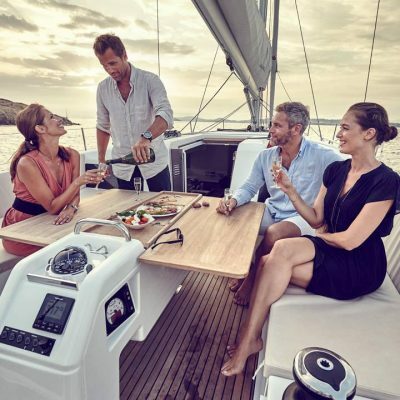 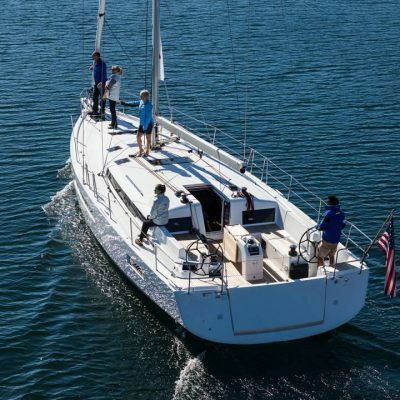 The twin wheels, wide split backstay and extra large electronic swim platform offer easy boarding and clear access through to the companionway. The engine start panel is incorporated into the central cockpit mould together with autopilot, steering compass and table/transom and light controls. 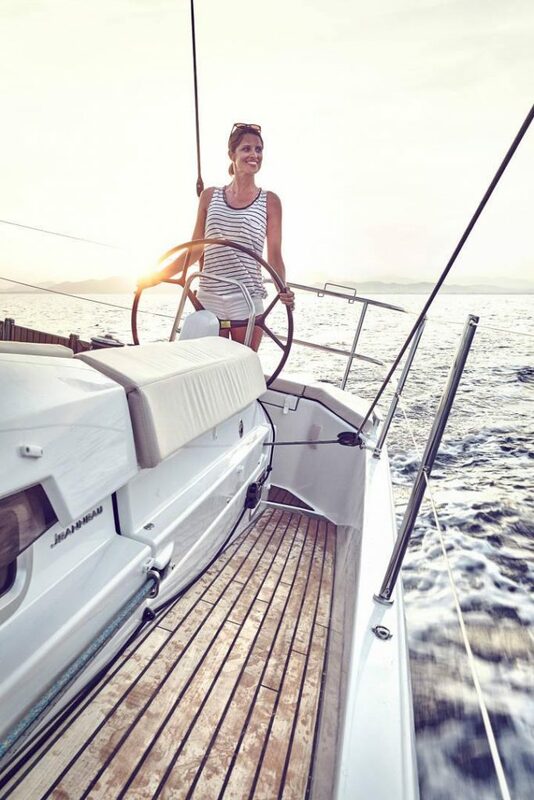 Centralised Electric Harken winches operated directly from the cockpit make short-handed sailing easy, safe and stress-free. 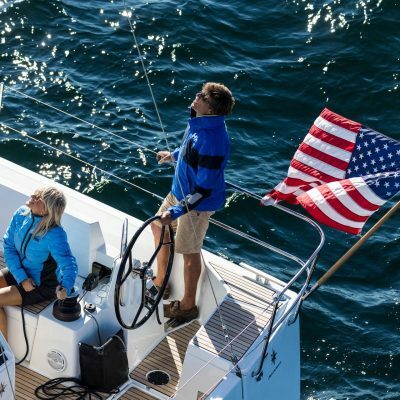 Up forward an integrated composite bowsprit houses the anchor and pushes the bow roller away from the stem, reducing bow dings and adding a sleek aesthetic look as well. 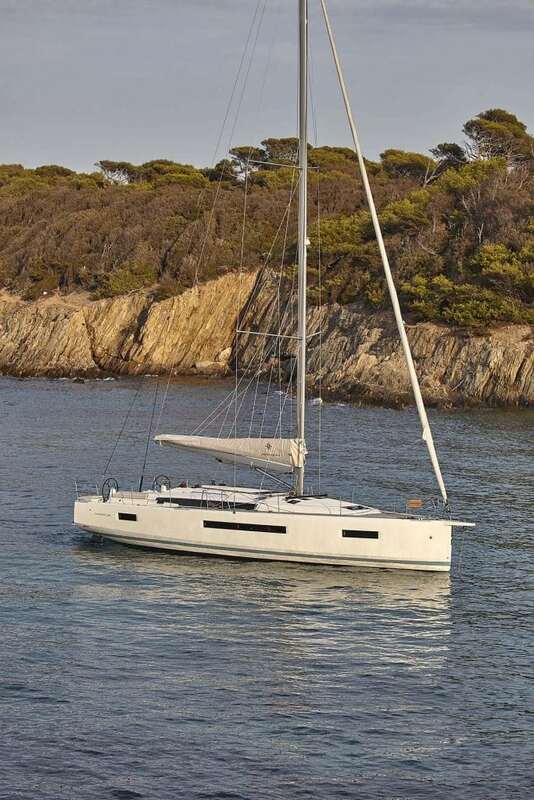 The standard engine is the Yanmar 57HP with sail-drive, but this can be upgraded to an 80HP. The upgraded 80HP will deliver over 9 knots at full throttle in smooth water. 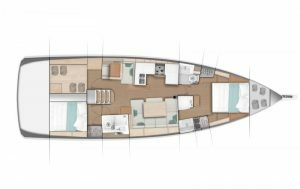 She generally handles well, but adding an optional bow thruster will make close-quarters manoeuvring and docking even easier. 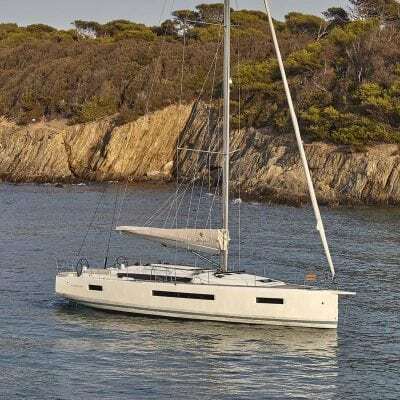 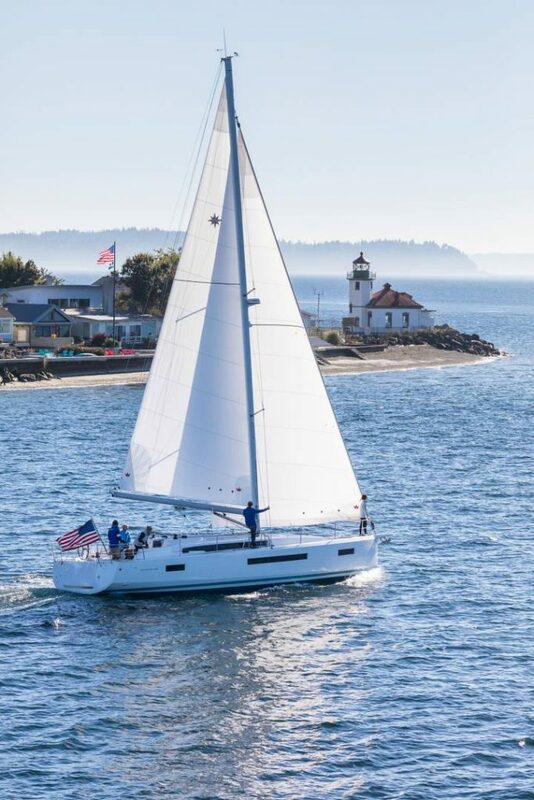 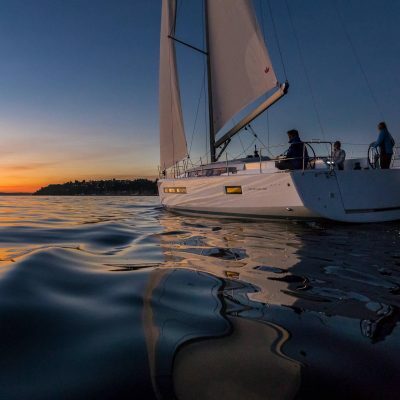 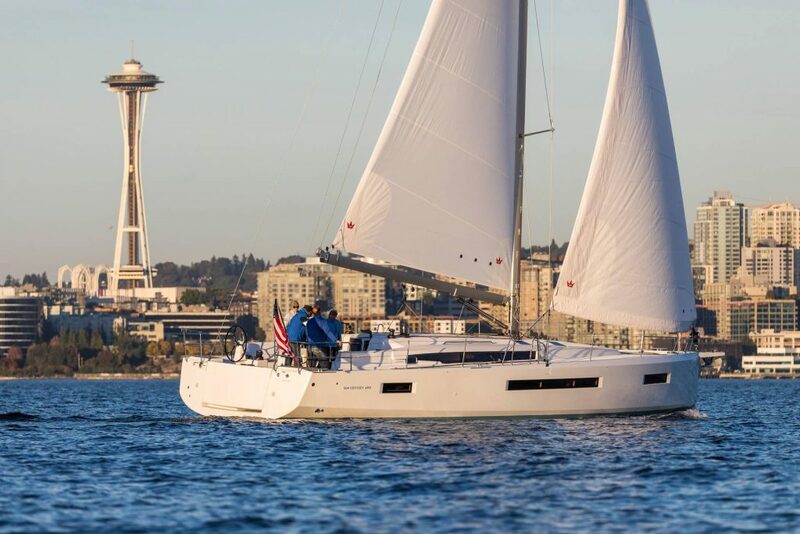 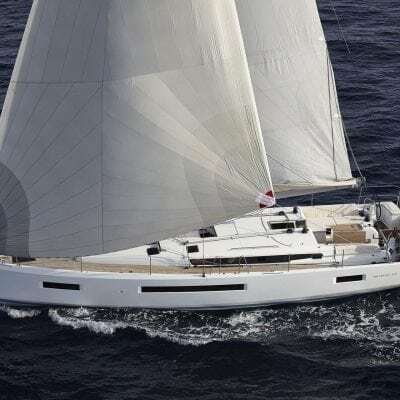 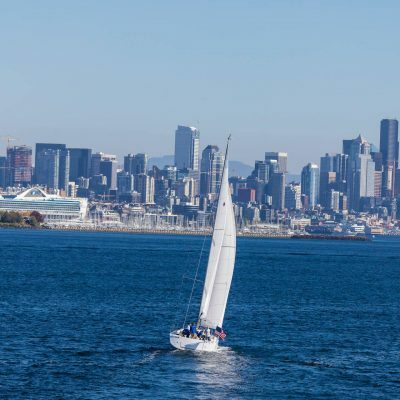 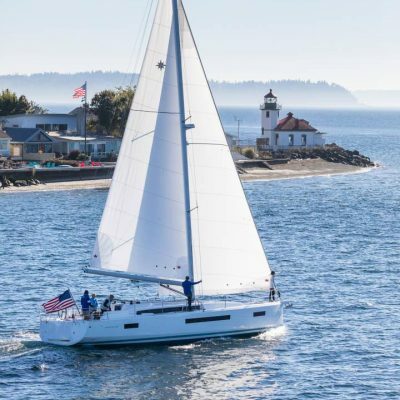 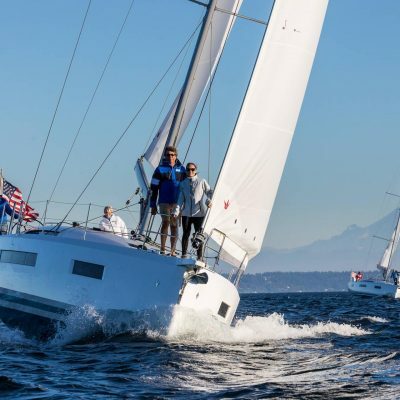 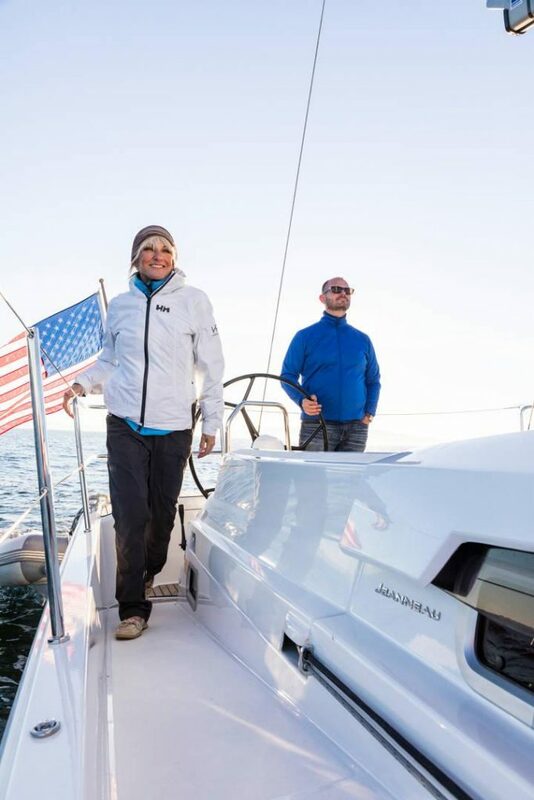 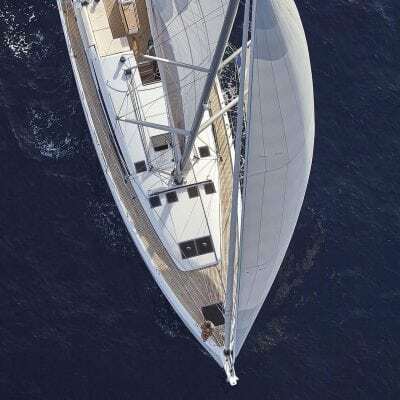 A double-spreader Z-spar mast, standard mainsail with sail bag and a 125 per cent genoa comes as standard giving you a total of 1188 square feet of sail area. 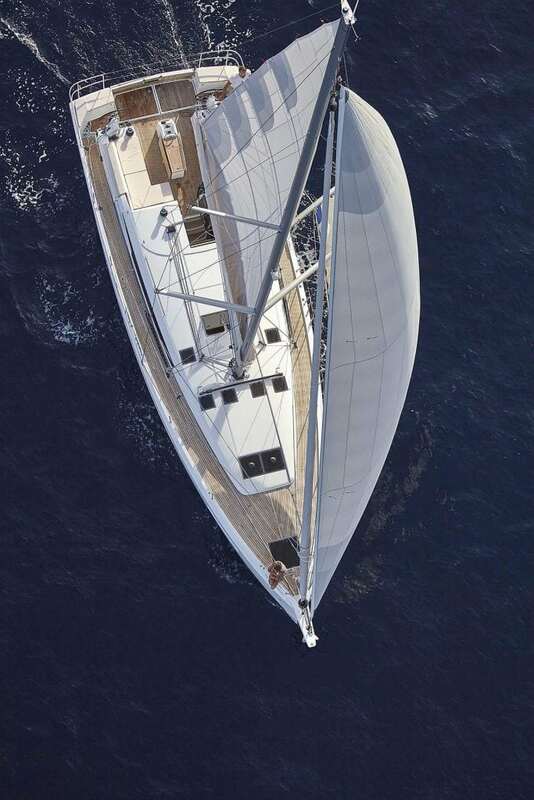 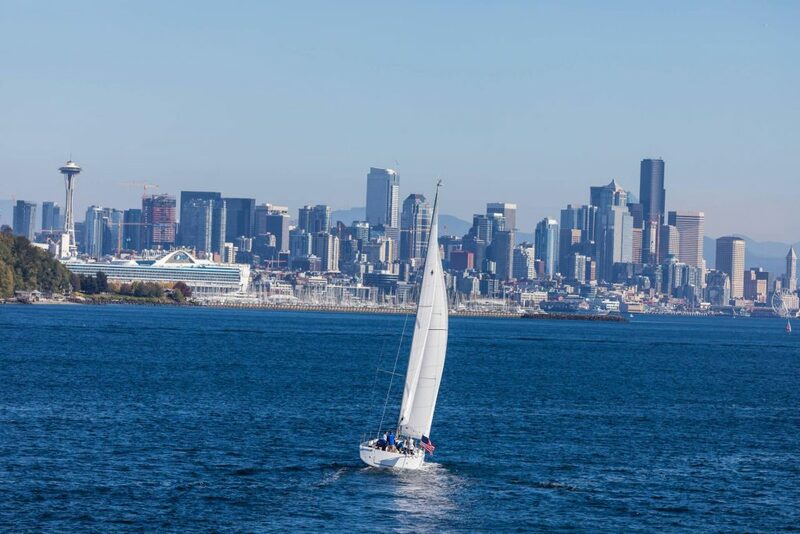 There are no jib tracks on deck due to the use of friction rings on the headsail sheets. 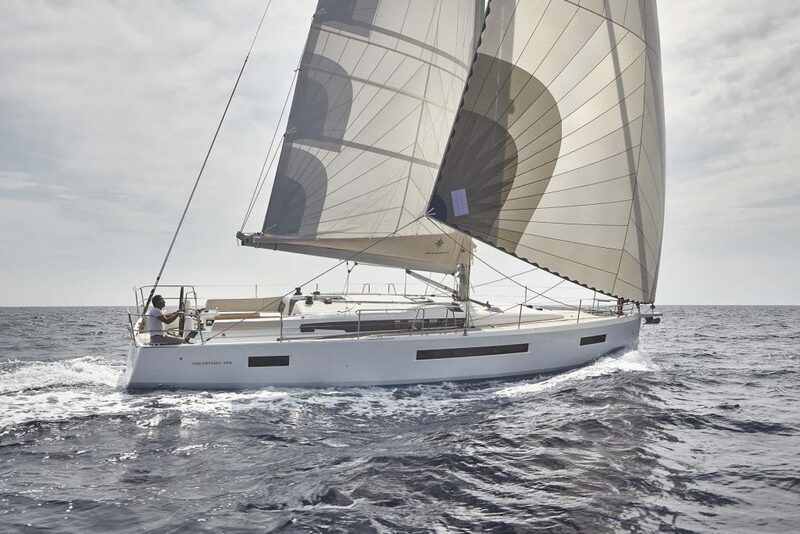 However, you can opt for in-mast furling and a self-tacking jib with a track just ahead of the mast for even easier sail handling. 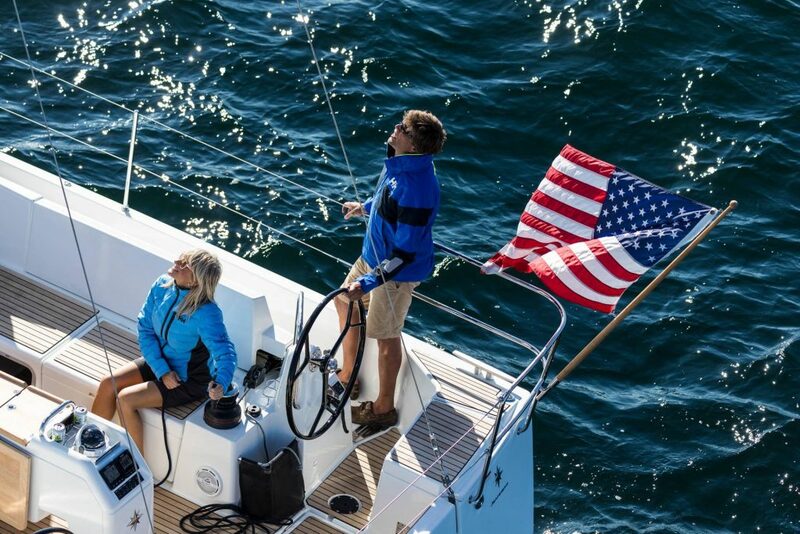 One great feature of the 490 is that the Harken primary winches are set on pedestals inboard which means the crew can now face forward while grinding in genoa sheets. Designed by Jean-Marc Piaton and Rafael Bonet the interior offers multiple configurations. 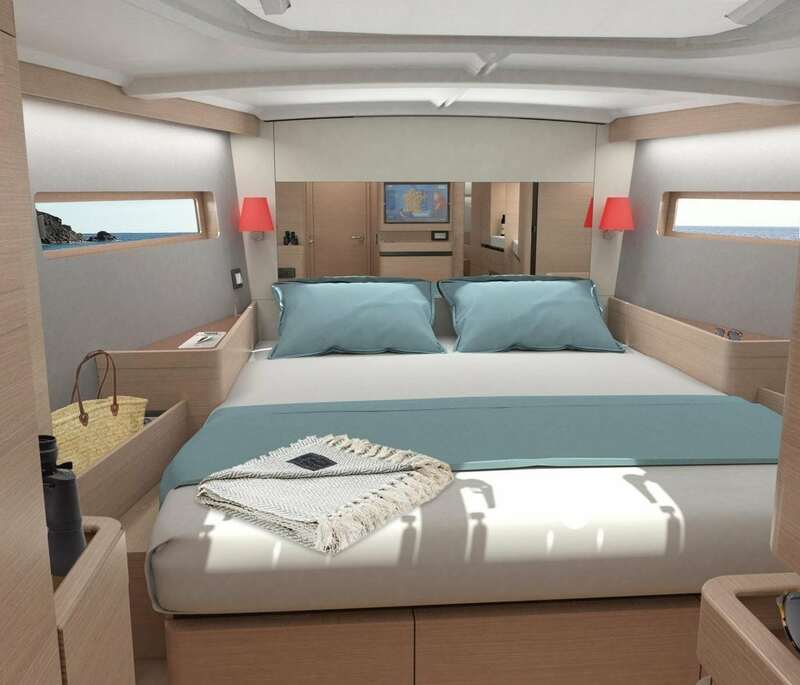 There is an option for two to five cabins with two-four heads. 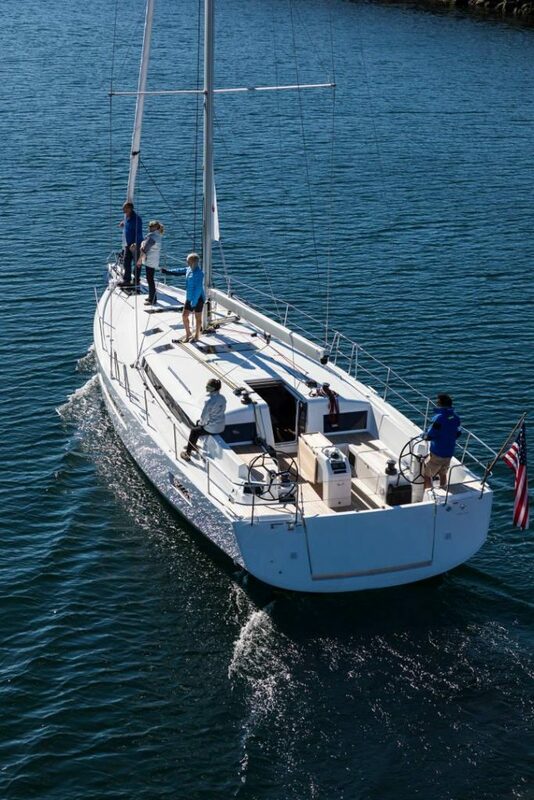 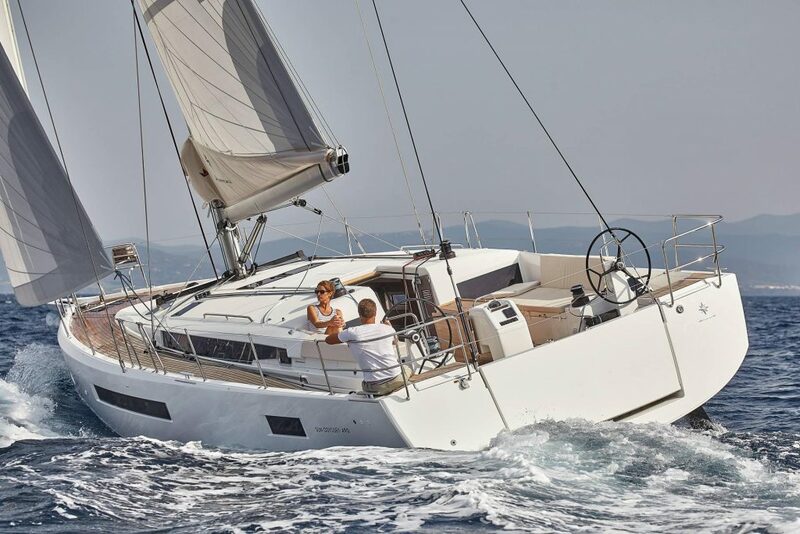 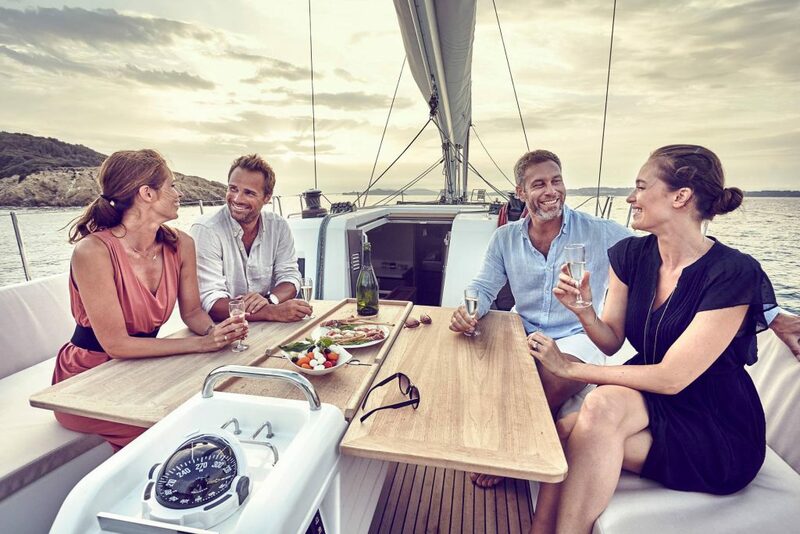 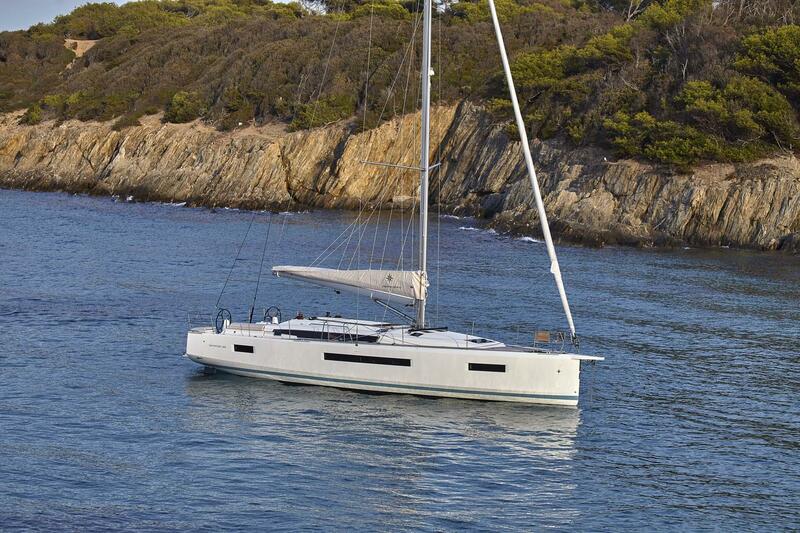 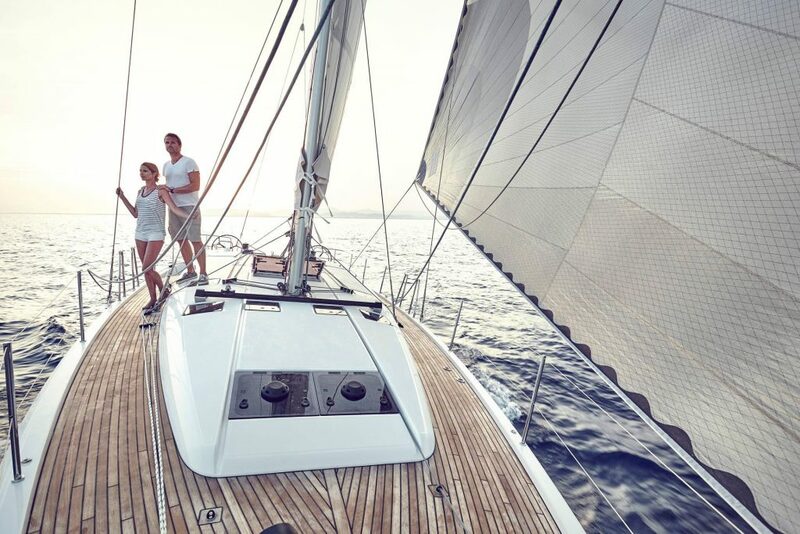 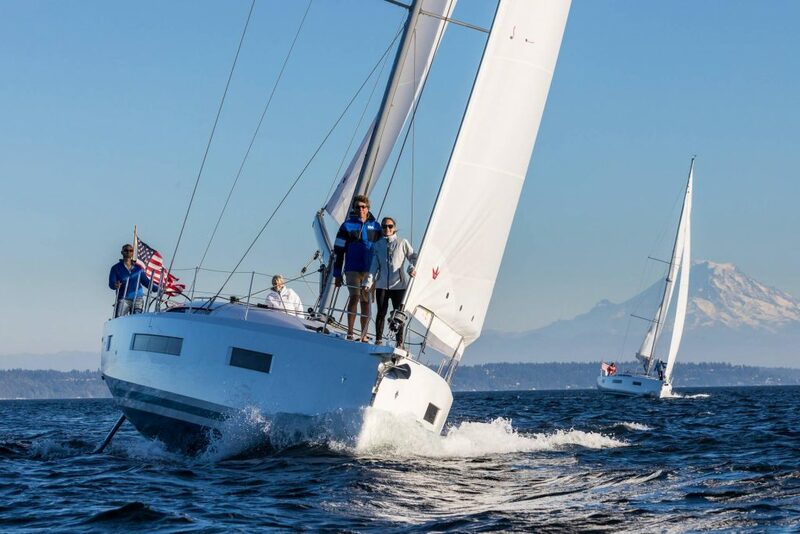 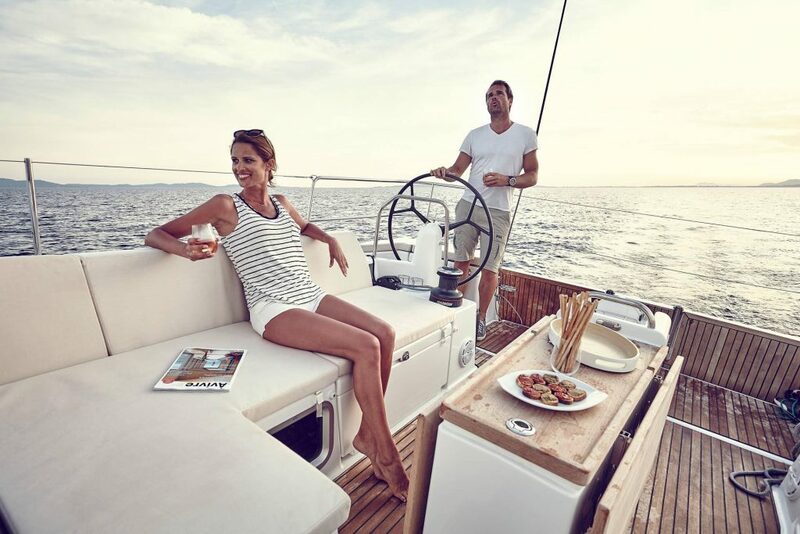 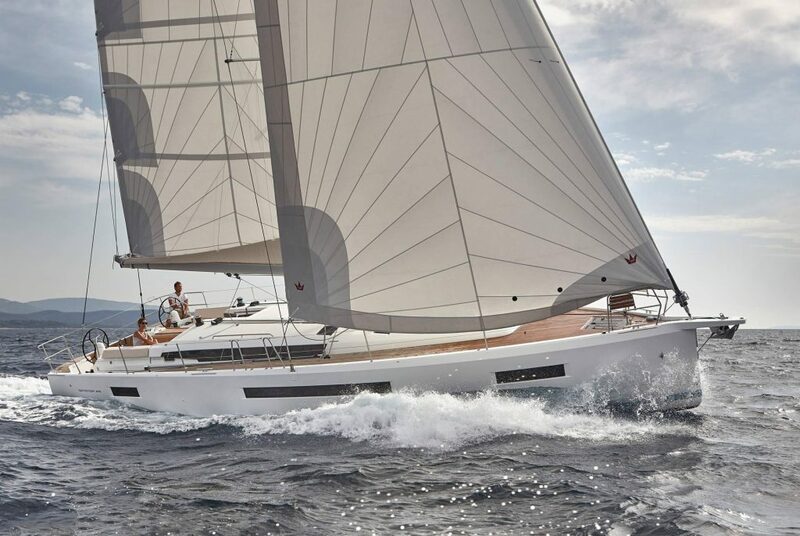 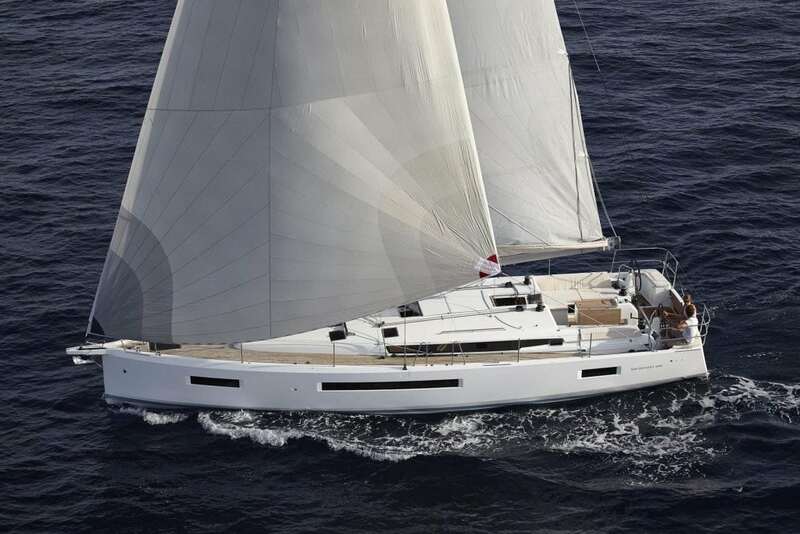 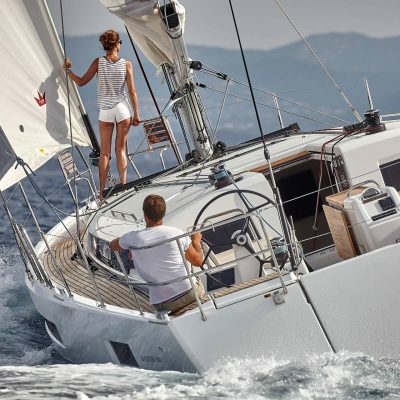 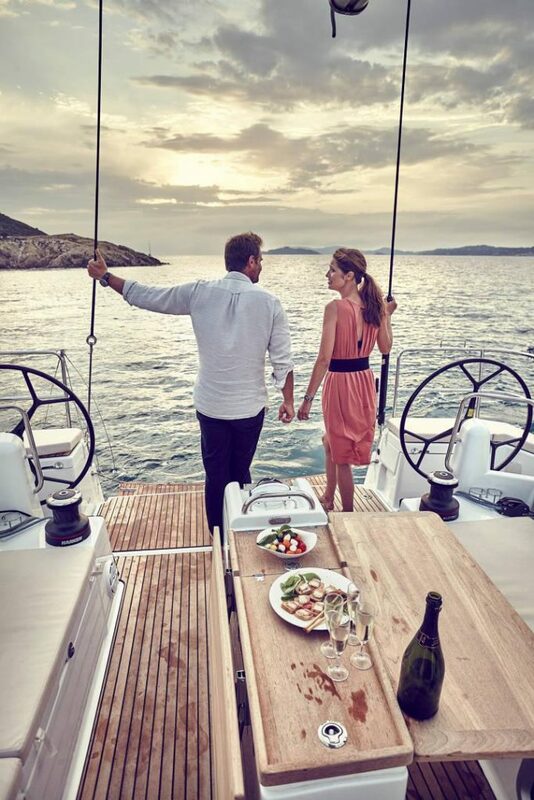 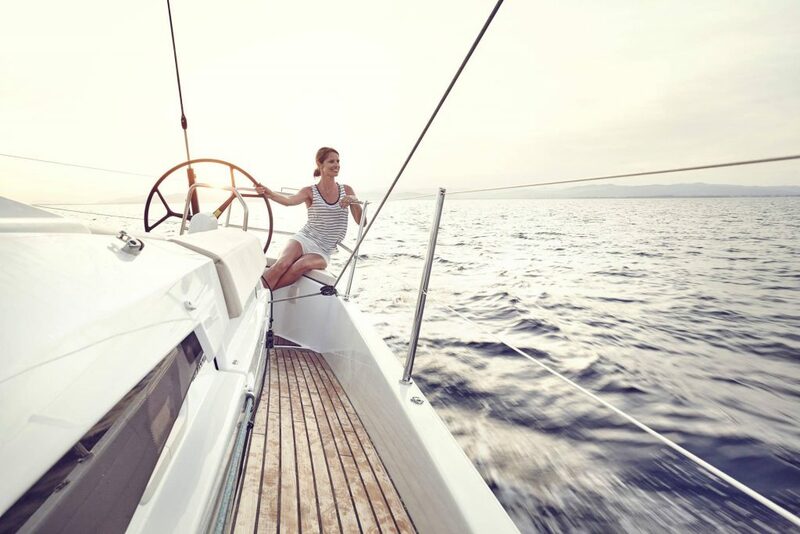 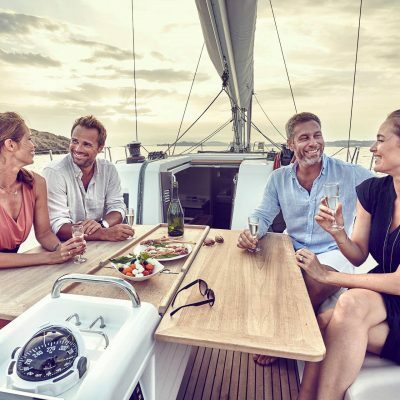 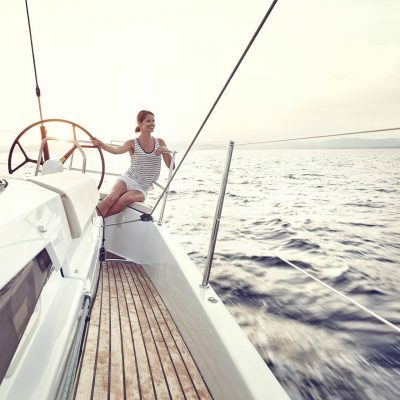 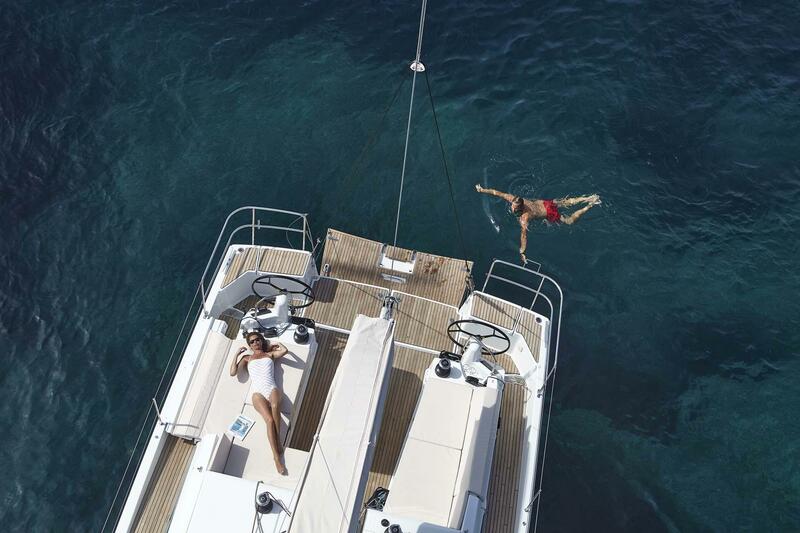 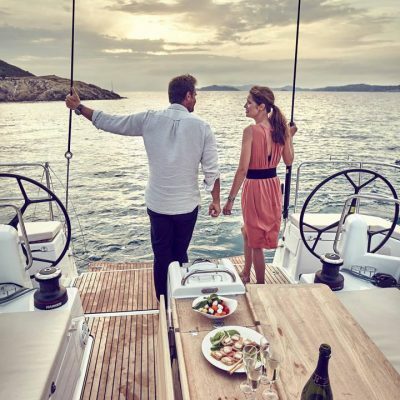 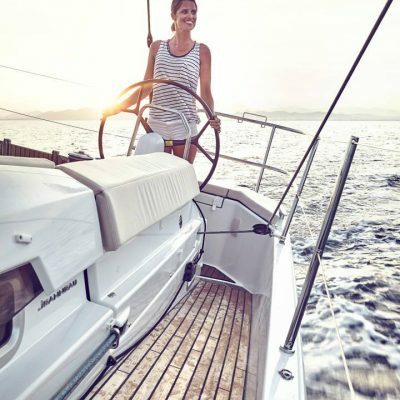 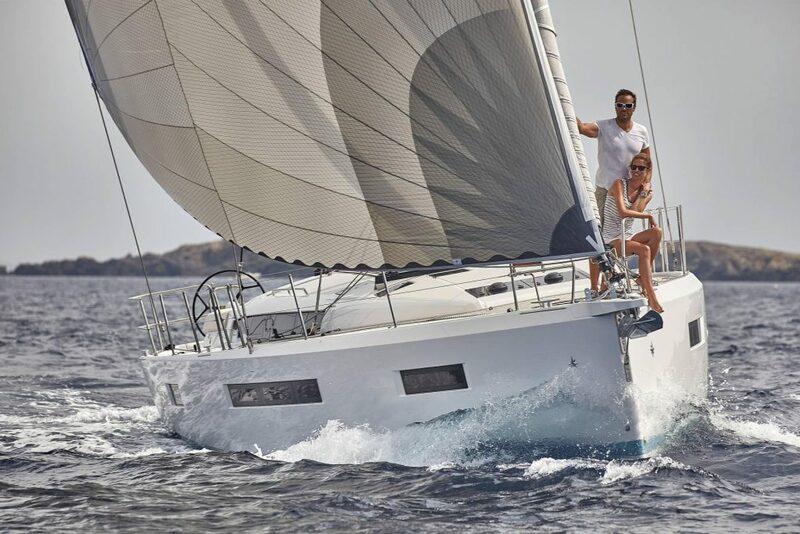 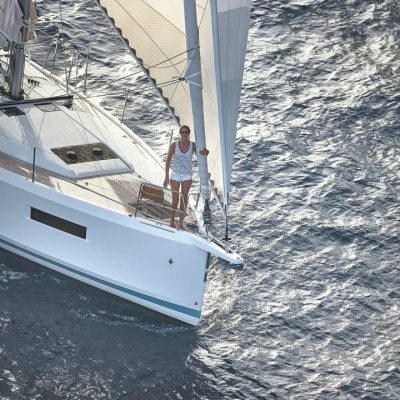 The Jeanneau 490 will appeal to larger groups or those looking to sail in spacious luxury. 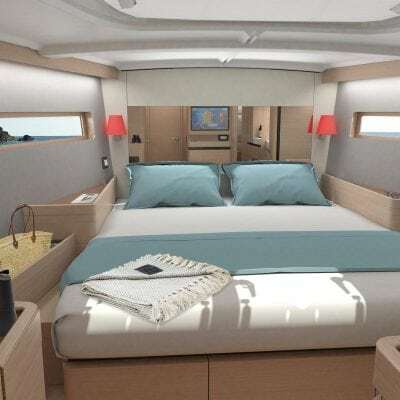 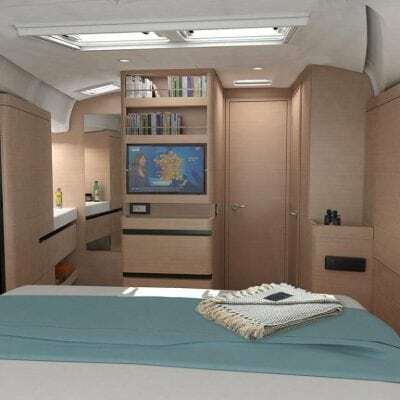 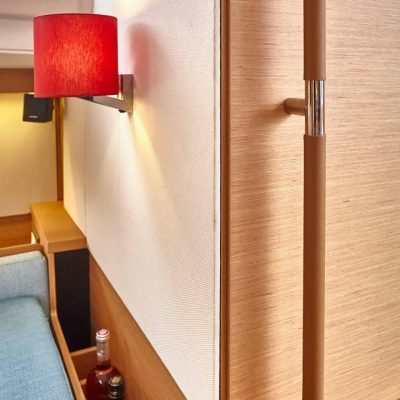 With two heads and two or three cabins, the forward Queen size island berth is on the centerline and has a private shower to starboard and separate head to port. 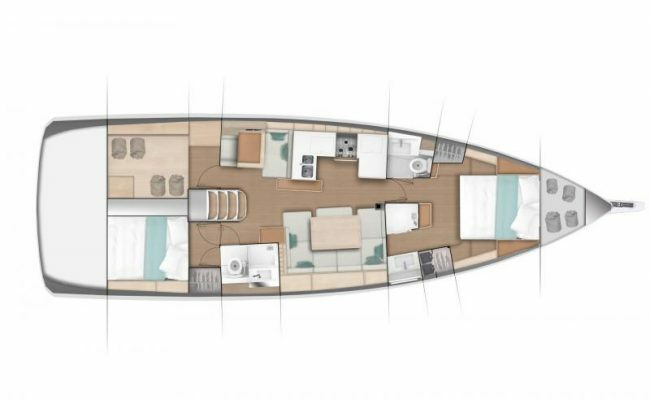 In the 4 cabin 4 head version, there are two double berths forward separated by a removable bulkhead, and two doubles aft, each with their own head/shower. 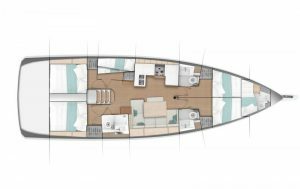 There is no compromise in space here as the hard chine hull flares out above the waterline ensuring maximum volume inside. 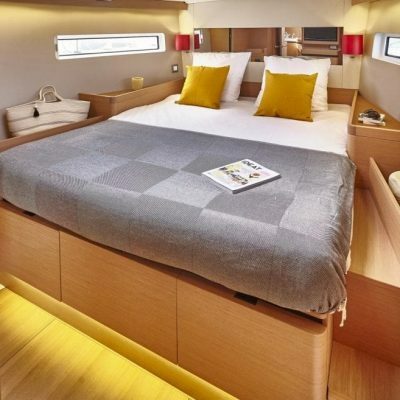 There is also a small “skipper berth” in the bow. 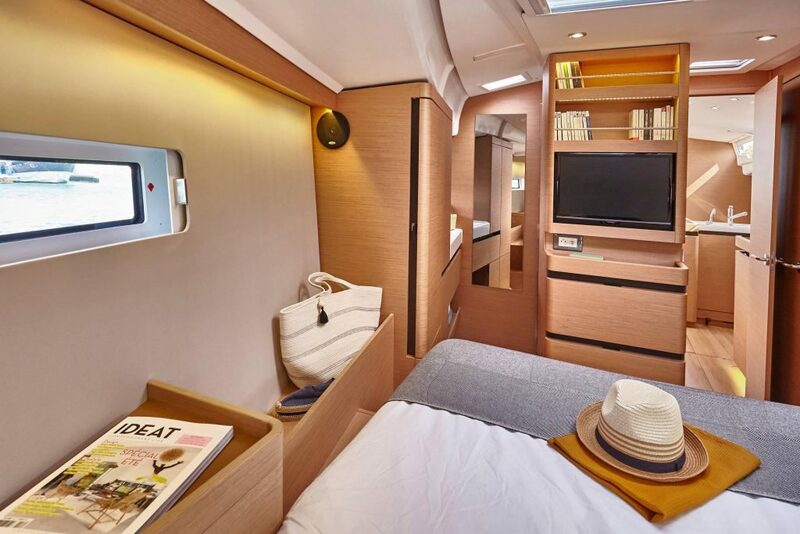 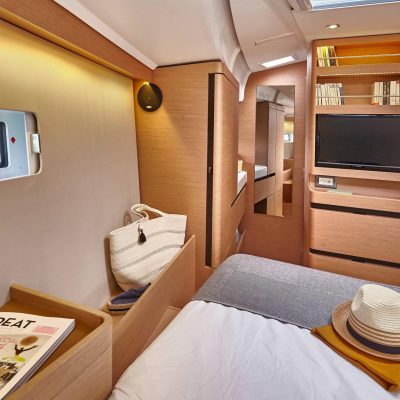 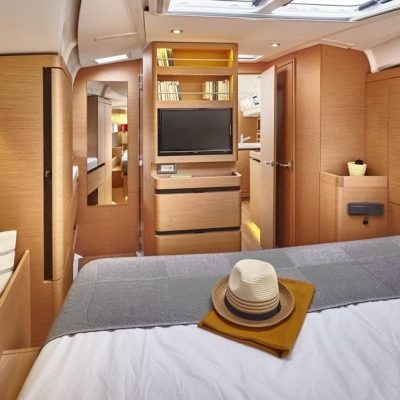 The 5 cabin 3 head option has an over/under bunk to port, just aft of the galley and that berth and the two aft doubles share a head to starboard. 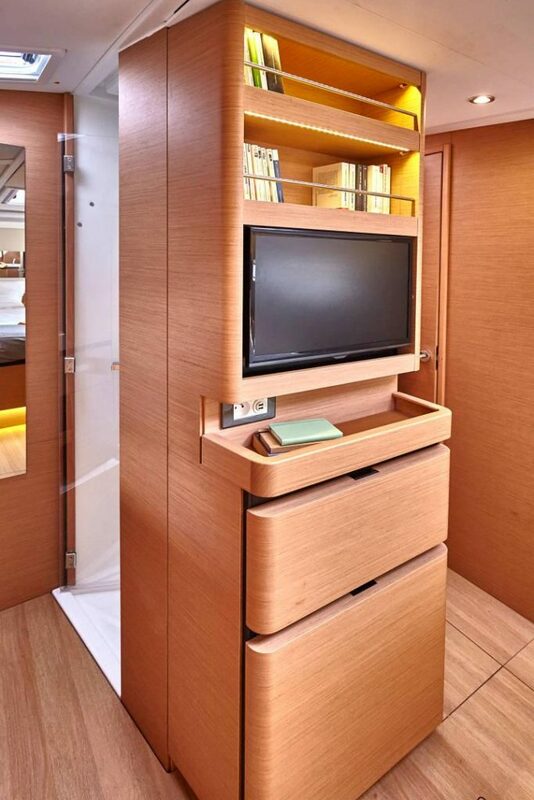 Another stroke of design brilliance is that all drawers and cabinets in the salon open parallel to the centreline, so nothing flies out when opened underway. 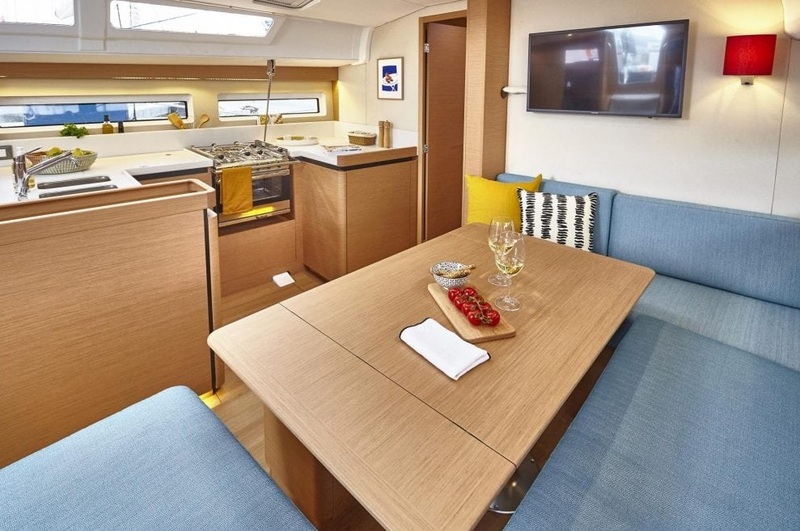 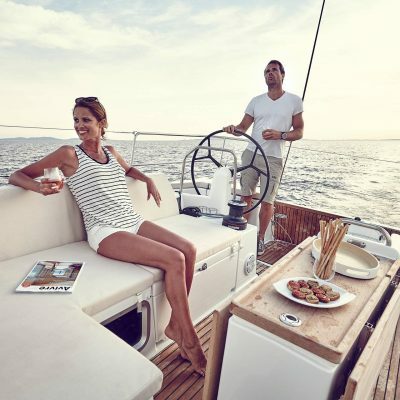 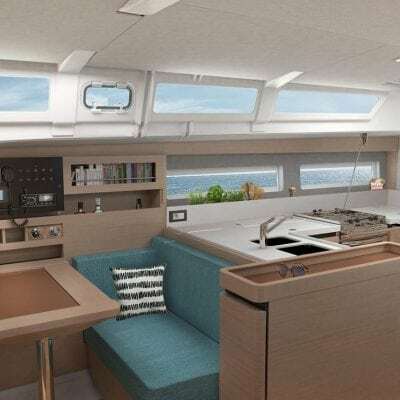 There is space and functionality a plenty: In the two and three cabin versions a forward facing chart table/Nav station that also forms part of a dinette area with a bench seat (with storage underneath) between the desk and the galley. 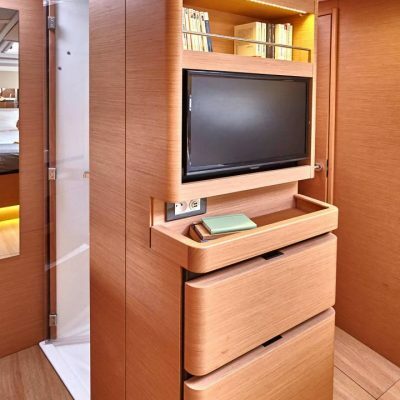 (this is lost when the 4 and 5 cabin options are selected). 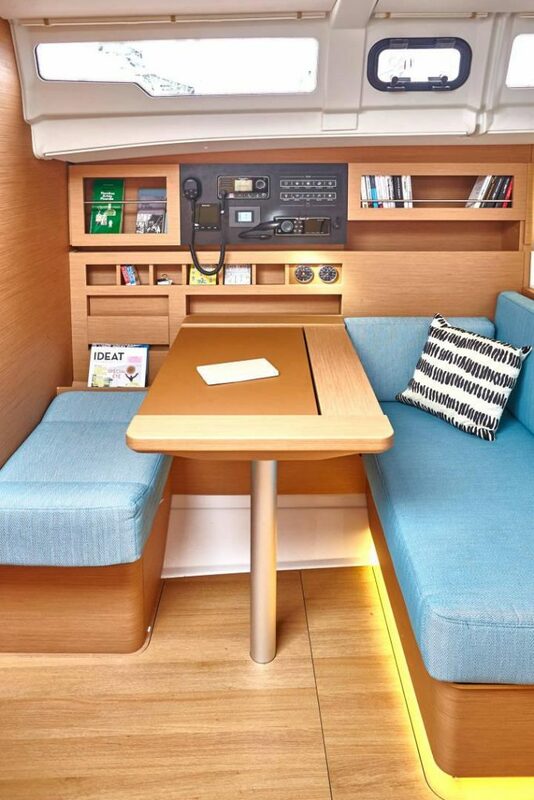 The galley itself has a nice island with storage and also works as something to brace against underway. 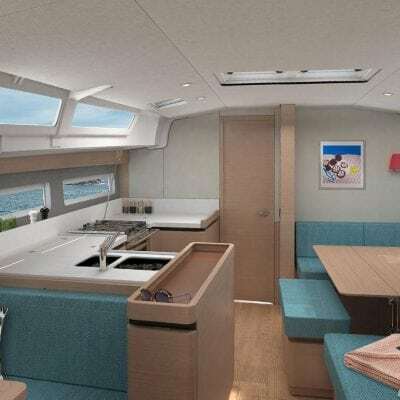 There is a three-burner stove and oven, double sinks, freezer and refrigerator. 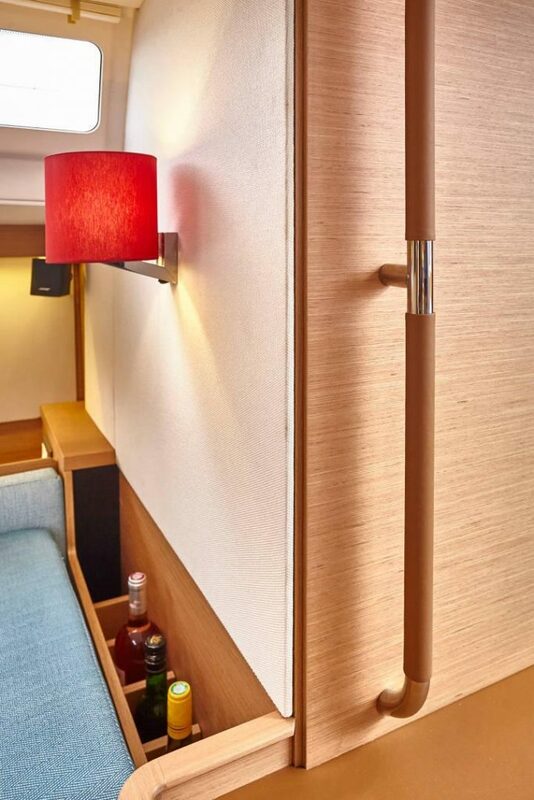 There is additional wine bottle storage under the flooring. 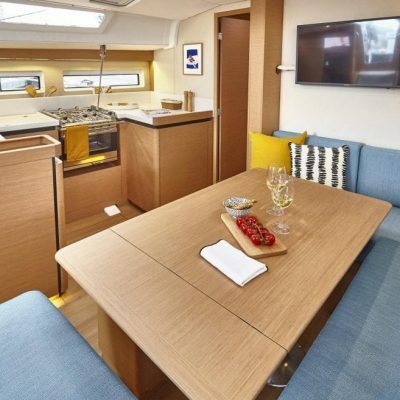 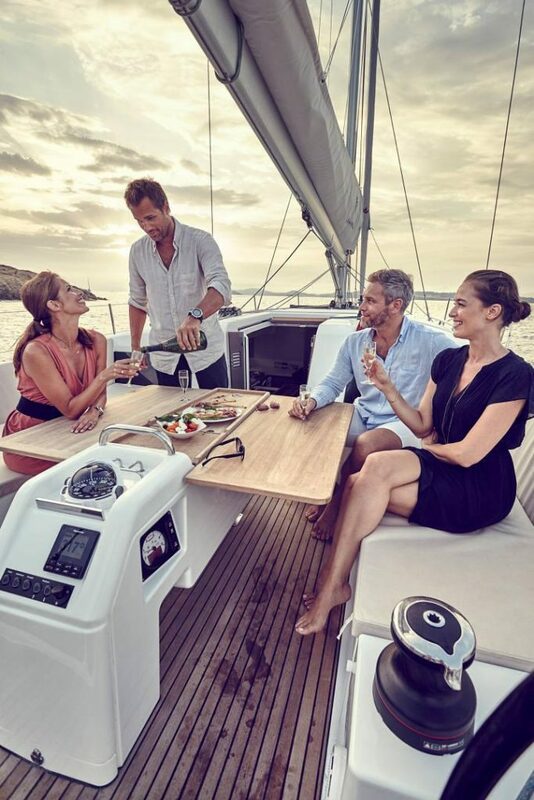 To starboard, there is a generous folding dining table with a central bench seat and there is plentiful storage under the seats. 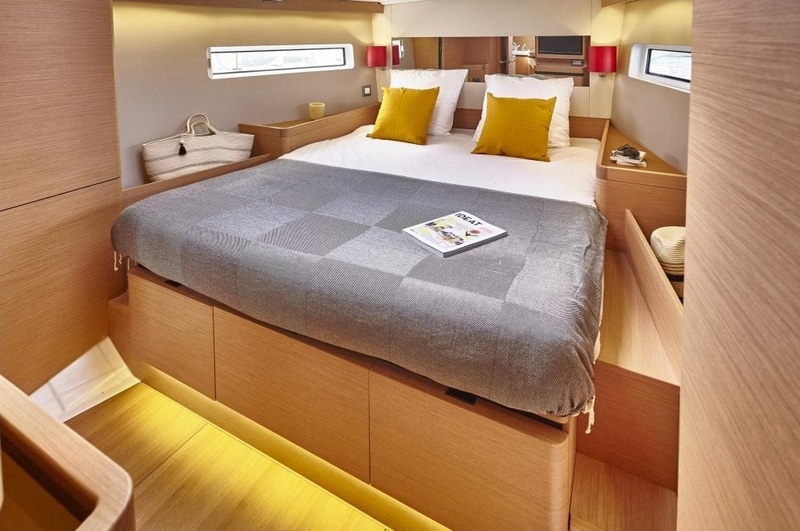 The table can also lower to form an extra double berth and the light below is exceptional, with hull and deck portlights supplemented by multiple hatches. 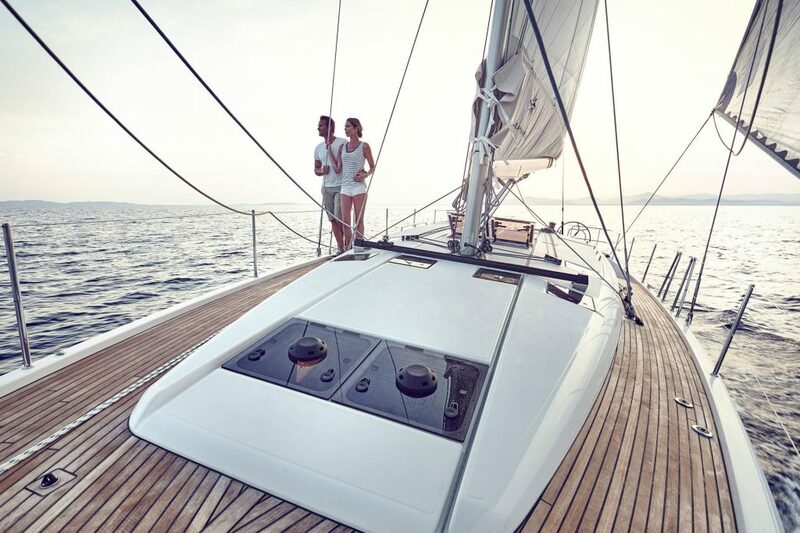 The interior finish is pure Jeanneau. 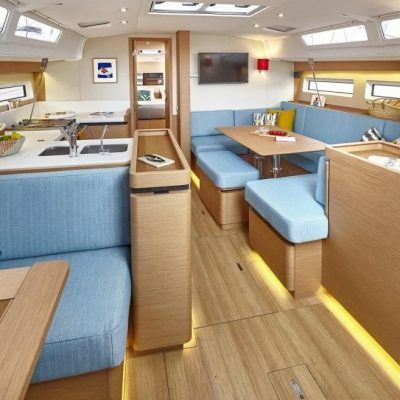 Fabric-covered bulkhead panels provide some sound attenuation and the Alpi wood finish is available in either teak or grey cedar, and there is a choice of flooring. 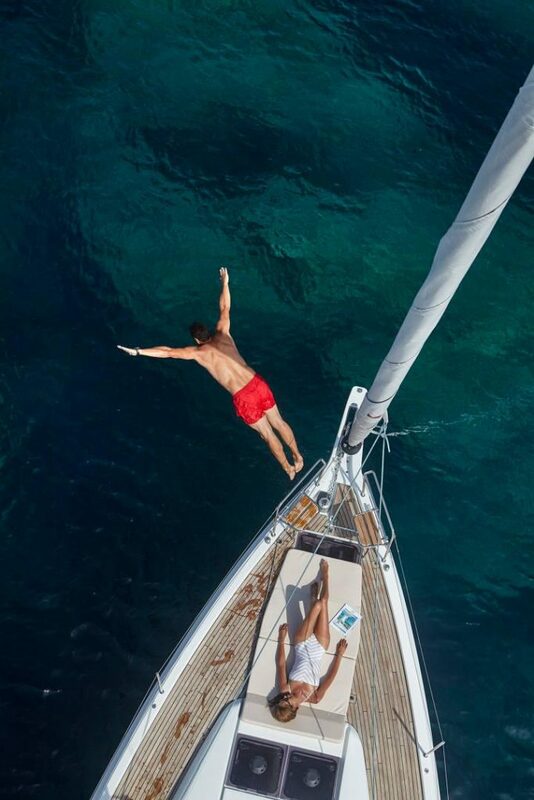 Your information has been successfully sent to Horizon Yacht Sales. 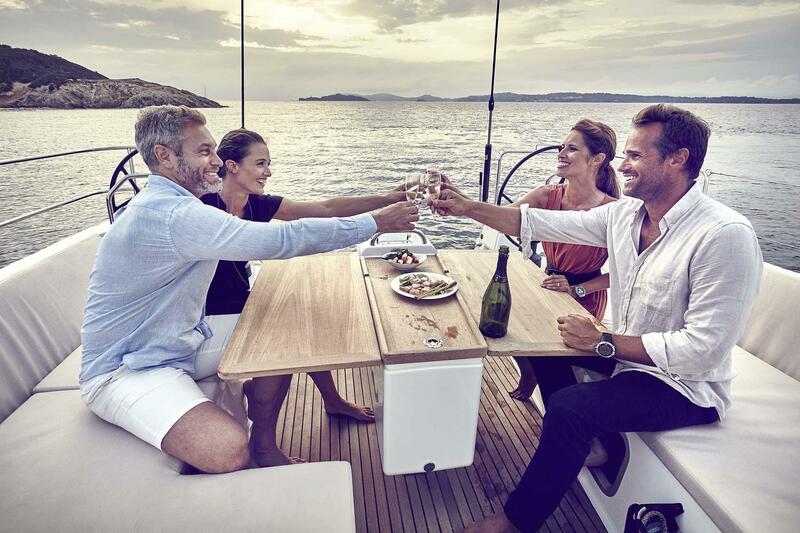 Our yacht sales team will review your request and get back to you shortly.